This weekend my grandson, Carson, celebrated his birthday Angry Bird style. 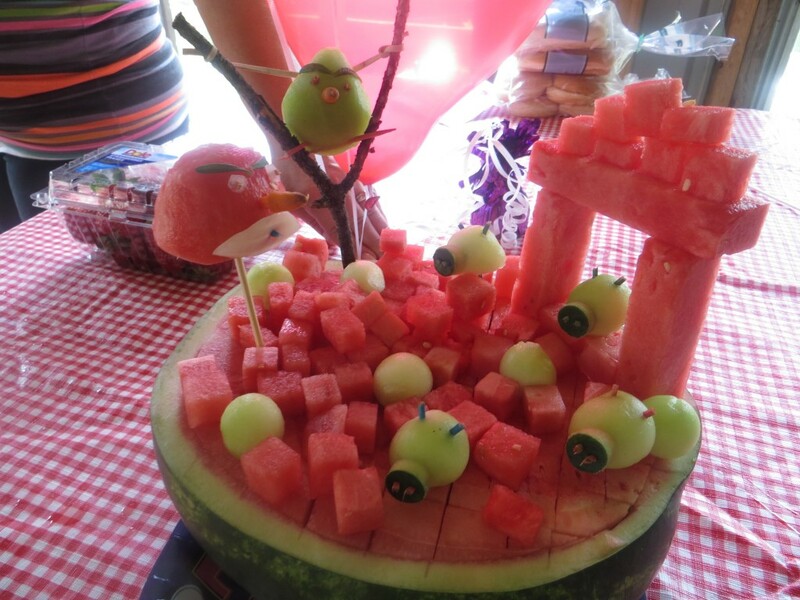 Besides having an Angry Bird cake and a six-foot, giant-size sling shot, there was the Angry Bird fruit bowl. Plan on at least an hour to put all the pieces together. But, as you can see, it’s worth the time and effort. Many thanks to the wine guy for running with my idea while I filled 150 water balloons. Here is how the birds and pigs were assembled. 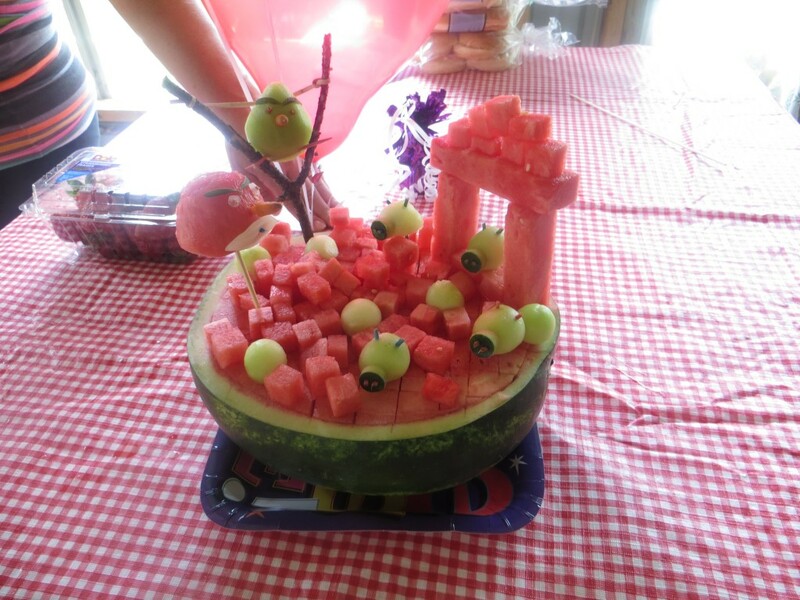 Slice a watermelon in half, and cube into bite size pieces. 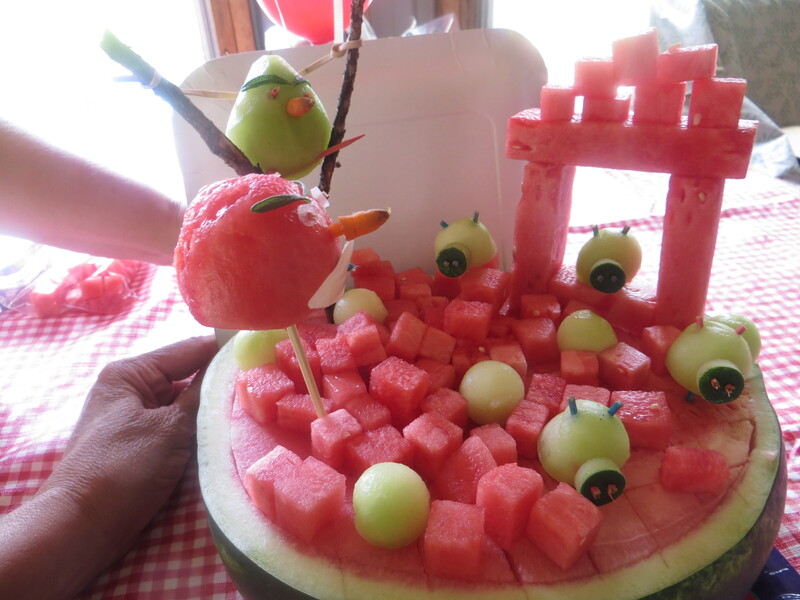 Cut 4 pieces of watermelon into long strips to form the base for Angry Bird tower. 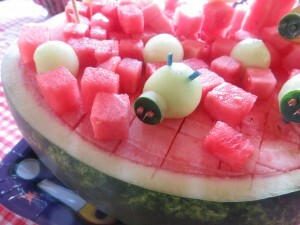 Place the cubes back into one of the watermelon halves along with honeydew melon balls. The picture doesn’t show it, but we also mixed in strawberries and raspberries with the melon. The birds were hand-carved with a paring knife, as were the snouts of the pigs. Shaved watermelon skin were secured to the snouts with toothpicks (the toothpicks formed the nostrils). Colored toothpicks = pig ears, carrot tips = bird nose, onions = red bird eyes & mouth/toothpicks are the pupils, toothpicks = green bird eyes and rosemary = bird eyebrows. A rubber band attached to a V-shaped stick forms the slingshot. Hope you have as much fun with this fruit bowl as we did. It was a big hit at the party and the seeing the smile on our grandson’s face made it all worthwhile.